Another post like this, and Motormouth would have been officially cleansed himself off all the guilt-ridden extravagant fares for the whole week. The previous post on Steamhouse reinstated this fact, though that happened more than a month ago. Just last night, after a barrage of heavy lunches (buffets for 3 days in a row! ), I came to my senses. Okay, so Jason helped somewhat, successfully slapping (an analogy, of course) me back to reality. And while I was still contemplating on whether should I take a quick nap (read : 2 hours, at least) at such random hours, or settled for dinner and tuck in earlier, a decision was made. 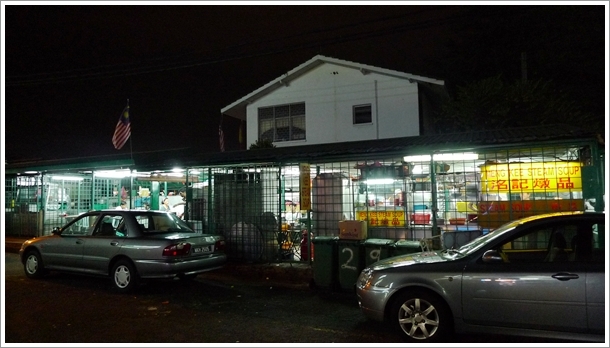 Dinner @ Meng Kee, Paramount Garden – Not THIS sinful Meng Kee Char Siew, but at the opposite end of the spectrum; a hole in the wall shack with zinc roofs serving hearty, simple yet effective home cuisine. And in the middle of them all; their incomparable selection of steam soups …..
Braised Chicken with Potatoes – If you had told me that this was a Chinese version of the Pongteh, I would have been sold. Savoury with a touch of sweetness, and loaded with chunks of soft potatoes soaking up the delicious gravy. Close to 8pm, and all of their vegetable soups have been sold off. Shucks. 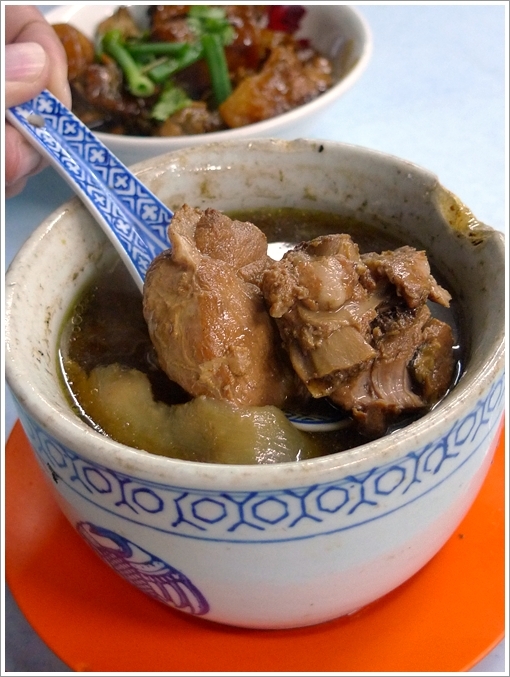 But then again, they still had various soups with pork, chicken, and some random offal (pig’s brain etc). We settled for a very Korean sounding Hor Sang Woo with Pork (spare ribs), which arrived piping hot yet not to the point of scalding the tongue. A sip of the soup brought back memories of drinking soups back in my home in Ipoh. When Grandma used to cook different soups on different days. Not salty, with the original sweetness from the spare ribs (a few chunks thrown in that were surprisingly still tender and moist albeit the boiling process), and various herbs (beats me how to translate them into English ….). Best of all? We did not reach for our drinks like a dehydrated camel chancing upon an oasis in the desert. Read : No MSG. 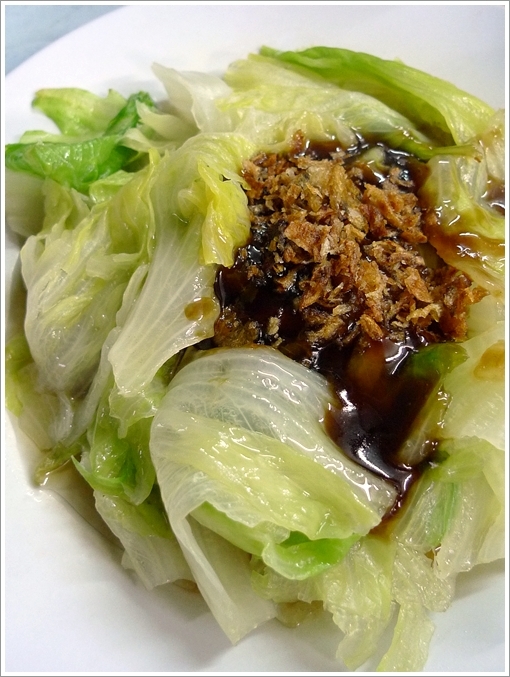 Simple blanched lettuce with oyster sauce and fried shallots. They have specials of the day, and Jason was actually keeping his fingers crossed for their curry wild boar. Ahem, that defeats the purpose of eating healthily okay? 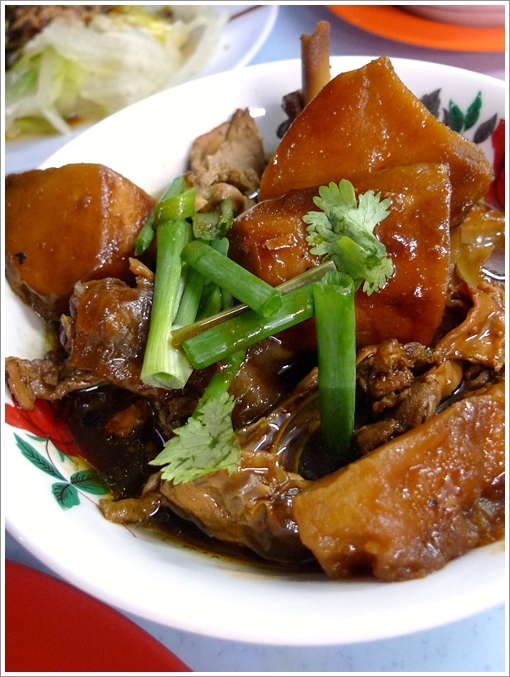 Hence they recommended a slew of chicken/pork dishes, and the thought of having chicken and potatoes was inviting. How could the combination go wrong, right? True enough, a plate of Braised Chicken with Potatoes arrived in a dark-toned gravy, appearing slightly bland on the aesthetic end of things. However, this was so good, so homely and blended in so right with the home-cooked food concept, that you can’t help but dousing your white rice with the gravy and walloping the potatoes and chicken clean. Would have been better if they serve meatier parts though, but small lament this one. He said cheesy to snap the menu, but like I care …. Haha … least this jolts memories in the future, and you can call them up to inquire about certain soup’s availability before going over and jostling with the congestion. Btw, parking’s a horror, unless you don’t mind parking a street or two away. If you’re one who shies away from street foods served in this environment, then shame on you. If you’re from the school of thoughts that impose restrictions on food served by the roadside, without air-conditioning (or even fans to begin with), and no Wifi access, then you’d better come back down to earth. Talk to your grandparents or parents to grasp this concept. Good food does not necessarily come with an exorbitant price tag. Opens for dinner only, from about 5-6pm onwards. 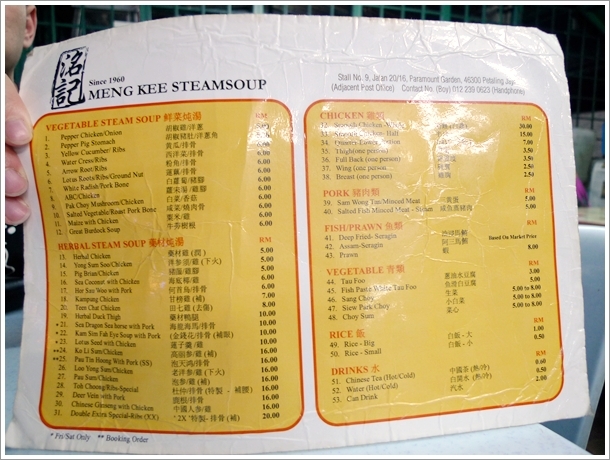 Here’s a Google Map to Meng Kee. eh, so near my work place..didnt know got such hoh liau eh stuff..
will there makan liau . .
My goodnessss, I been missing this for so long ever since i moved back to Ipoh year ago, this place is jz like a place for me to itch my mouth whenever i thought of my mom’s soup, love it and the price is quite reasonable too. Haha … and now we are at the entirely different end of the spectrum. I moved from Ipoh to KL, and you did otherwise.